Located in Grays Harbor County, Aberdeen is famous for being home to famous musicians and writers. This former mill town of about 17,000 people is a fascinating place. Visitors can now visit this plaque as well as a statue of Cobain’s beloved Fender Jag-Stang guitar, in a park by the Young Street bridge. 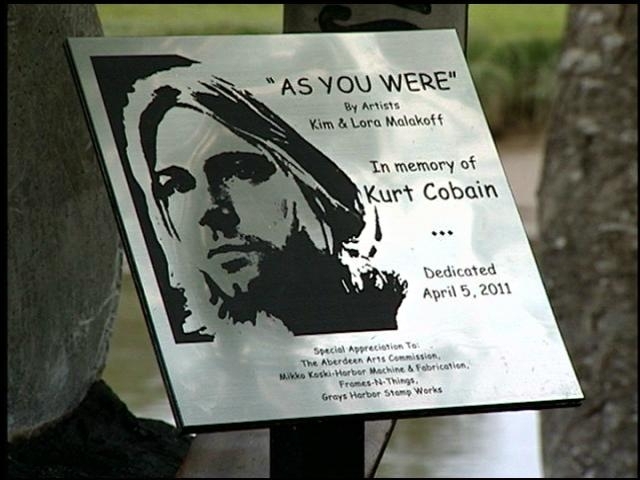 The plaque and statue were unveiled during a ceremony April 5, on the 17th anniversary of Cobain’s death. If you like live entertainment, you’re in for a treat! The historic D & R Theatre, which opened in 1923 and hosted vaudeville acts, has been meticulously restored to resemble its original state. This cozy theater now boasts a state-of-the-art sound and lighting system and other modern features. Whether you like rock, country or comedy, top acts are coming to the D & R Theatre including REO Speedwagon, Gallagher, Wynonna and the B-52’s. Washington state’s official ship is docked in Aberdeen. The Lady Washington is a full-scale replica of the original vessel that was a privateer in the American Revolution. She and her partner the Hawaiian Chieftain welcome the public for summer sailing in Puget Sound. The ships also provide educational opportunities for thousands of children each year. With 156 lines and six miles of rigging, the Lady Washington is one impressive ship!